This book is outstanding!! Very inspirational and a great learning experience. you can read it all at once or an acronym a day to lift your spirits and bring you closer to God. Misty's story on her amazing healing of her skin cancer is an awesome and trul amazing testimony. I recommend this book to anyone and everyone that needs a lift in their spirit! I just finished listening to your audio! What a blessing to listen to your book; your God-given acronym’s & God's Holy Word set to beautiful music in the background. It was so amazingly well done! Your book blesses me each time I read it & now I have been blessed to be able to listen to it! God is using you in awesome ways through your ministry & I pray that God will continue to stretch & grow your outreach through this audio book. Thank you for asking me to be a tiny part of the process. I LOVED the addition of the shofar information & the shofar playing! Such an awesome addition for the audio! I also loved Chapter 7 & the interview with your pastor. I thought it really added a more personal insight into your heart & your ministry & your love of the LORD. Be sure to let me know when the audio is ready to purchase! Hopefully, in time for Christmas gift-giving! I'm really proud of you and wow the ending is AWESOME! You and your pastor do a great job, and by the way you have a great voice you could have done that whole book yourself. I liked the music too. God has blessed this book, Thank you LORD! we give you all the praise! Wanted to send some Godly love your way from the Reese’s….Thinking of you often and appreciate your ministry and friendship as well. Keep up the great work. BE ENCOURAGED!!!!! You book has an amazing way of bringing words in Scripture to life. Every letter has a meaning to the Words of the Bible. His words are "Life". Thank you so much for sharing your gifts with me. I am with you in the journey that the Lord has for you. I love your heart for the lost of this world. Hey Misty..it is so awesome to have you on WORLD WIDE RADIO again today!! Looking forward to hearing from you again..N.A.I.L.S. is one of my FAVORITE BOOKS and I thank God He gave you the wisdom to write it through His inspiration. You are an incredible lady!! We love you!! Misty! I am equally inspired by your amazing and anointed acronyms of truth. I get encouraged reading them and seeing the hidden meaning behind simple words! Wow..God is very creative and uses us all in very special ways. Thank You Misty, My New Friend in CHRIST. I too had skin cancer in 1982. We were clearing land, and I had a rash so i went to My family Dr. After medi He sent Me to a skin specialist. In GODs plan it was Sept. , I wore short sleeves and He saw it . If not for the rash on My arm from My LORD JESUS I would not be here Today// The spot Had been on My arm from childhood. I was thrilled when I realized who you are. I have really enjoyed the acronyms that Crucial has talked about from your book. His vlogs have been a great encouragement to me and my family. It's great to meet a sister in Christ. My family gets bigger all the time. Keep using your story for the Lord! And thanks for having a sense of humor. I listened for awhile this morning. You are awesome!!!!! Helen O. sent me a copy of the wonderful and inspirational book you have written. From the moment I picked it up and began to read through the pages, it was obvious this book is an anointed labor of love. Who better could God have picked to write this book than one so sweet in spirit as you are? It is clear that N.A.I.L.S. is not only for those who are desperately seeing God's hand due to a great or sudden catastrophe in life, but also those who daily live and thrive on His Word! The book brought a constant smile on my face and joy in my heart to read the words you have so lovingly and obediently written down to share with all, because it is obvious that God is speaking through this book to all who read its pages. May God bless you in the task He has put before you to continue on, and carry out His great will for your life, for you truly are a wonderful daughter of God, and beautiful sister in Christ. I have a testimony to tell you too. My husband's cousin's son, just had a kidney removed. His back was hurting and he had an MRI and they found a spot on his kidney and it was cancer. We went to the hospital to see him and I had made him one of my cancer cards "What Cancer Cannot Do" and wrote some of your healing scriptures in it (with your web site). He took one look at it and said he knew he liked it and it was just what he needed and he would keep it forever. He told us when this happened to him he wasn't sure he was ready to die but he made the change and those scriptures were exactly what he needed. As far as we know he is doing well. On our stamping site there was a request for someone's sister that just had both kidneys removed and I sent her the same card. I don't know if she was a Christian and have not heard anything more but I sent the card with a prayer. I used the words HEALING and CANCER in those cards and I put used with permission and "NAILS" with your website. Life is like a piano. What we get out of it depends on how we play it. PRAISE THE LORD! To God Be The Glory! All is normal! That's what we heard this morning at the doctor's office. The doctor is confused and couldn't explain but Don's bone marrow biopsy shows nothing wrong. The test are all better and he is not anemic. Blood test normal – lower limits. He has more than normal iron which could cause damage if not known. Nothing serious – not leukemia. I am not surprised. I told Dr. Gregory we serve a Great God. Misty's book and the healing scriptures have been special at this time. I have claimed Jehovah Rapha – The Lord is my Healer. I haven't had an official report on my heart scan but the technician seemed to feel good about it and I'm standing on God's Word. "Great Is Thy Faithfulness", "His Eye Is On The Sparrow"
I just have to let you know that I spent a bit of a restless night. I know God has touched me and is healing this breathing situation but I went through your healing scriptures and Names of God and I’m claiming Jehovah Rapha. One of my favorite colors is yellow and that spoke to me. (Our Classic Mustang is yellow) Another favorite is pink. I love Butterflies. I just enjoyed going through the book. I Am the Lord that healeth thee. So many promises. As I was in my recliner trying to sleep but was awake I had the TV on Daystar with Creation Scapes and Worship music and this came to my mind so I wrote it down. Your name means to me MISTY Minister In Service To You. Your gift is a ministry and God gives it to you to share with us. I would love to tell how much I love and appreciate your book but I can't seem to get to the right place to do it. I'm anxiously awaiting your next book. I have given your book as gifts and sent recommendations to many about it. As a matter of fact, I have one of your cards right here at my computer and I send the web site to others often. I love it party because of it being so unique but mainly because it is about God. It's a wonderful testimony and wonderful way of sharing the gospel. The stores need to put up a special flyer about you and your book and specify you are an Oklahoma Author. . I'm wondering if you might have a book signing right here at the Mustang Library since you live in Oklahoma and your book is published right here in Mustang. Perhaps Tate’s could set it up easily. I'm also wondering about a promo about you and your book in the "Oklahoma Gazette" magazine as an Oklahoma Author. That would give them some nice, good item to put in this Okla. weekly paper magazine. They are free and you can pick up one at the Mustang Library and Jimmy's Egg in Yukon. Charleston's has them. Another little paper is put out by Moore. It's also free and I've found it at places like Poncho's on I-240. Your book is right beside me too as I've been reading the healing scriptures in it as well as my bible. Don had pneumonia in January and was in the hospital and has just been released from homebound care. He had a wonderful Christian doctor. The 17th I was gasping for breath and Don called 911 and I was transported to ER. I chose to come back home after treatment and diagnosis of bacterial pneumonia. I've been claiming God's promises and had to go for follow-up to my doctor yesterday and she prescribed more medication but I had prayed the Lord would guide her and I believe in the power of prayer. God is faithful. He will honor your gift from Him because you are giving honor to Him. As you signed my book with Prov. 16:3. I claim that too as I play the piano and make greeting cards. I sent a note to Mardel's via e-mail and told them I buy from the stores and your book needs to be on display as an Oklahoma Author and the inspiration it is. Told them I bought mine when you were at their store for your book signing. I also bought another one that day for a gift. You are most welcome to use anything you wish from what I sent to you. It is honest and I have suggested just today to several friends that they need to get this book for their loved ones. One of my close friends has a 29-year-old daughter with cancer and she has a strong trust in God and she told me she would see about your book to encourage her more. A lady at our church has a group of people that pray when there is a prayer request and sends e-mails out and I've told her about your book with the testimony and scriptures and hopefully she will pass the word along to her praying partners. I love books and love to give them as gifts. It's something that can be kept and used over and over. You have acronyms for Husband and Girl – may God give you one for Wife and Boy and maybe Baby. We have Frog and Dog – how about one for Cat, Lion, Dove or other animals? Words --- Music, Mercy, Promise, Psalm, You may already have some of those in your 2nd book. I know God gives you the ones that honor Him. That's what counts. I saw an acronym on the sign at the Nazarene church not long ago for Grace but it wasn't as inspiring as yours. Can't find where I wrote it but it didn't make much of an impression on me. My mom's very good friend, who is going through lung cancer treatments just called my mom and asked if she could get another autographed copy of your book. She is the one I made healing index cards for after reading your book again. I tell you....I get something new out of your book every time I read it. She has enjoyed your book so much and wants to give one to her pastor. My mom would also like another autographed copy. So, can I get three? I told mom to find out the pastor's name so you could address it to him. I have read this book and continue to go back to it and re-read parts. The anagrams (sic) in this book are truly God given to Miss McGlugritch. The anagram God gave her to describe the words are accurate and on the nose. You won’t regret it. Great Book! Inspirational! Moving Testimony! Misty McGlugritch is a wonderful author! Look forward to more books from this author. Misty has found a refreshing new approach for spreading God’s words and has given great honor to the divine knowledge bequeathed to her. The account she has given of her amazing recovery from breast cancer following her attendance at a Carman concert can be described as nothing less than an amazing MIRACLE. As a testament to God’s great triumph in Misty’s life, she has accorded great honor and has been rewarded by immeasurable success in her efforts to enlighten and encourage others through book donations to our military troops at home and abroad, many ministries and much more. This book has touched many of people lives and will continue to do so, but Misty, herself, is a walking testimony to a dark world around her. Misty works with my husband and I have seen her testimony of faith and the goodness of the Lord as He works through her be a witness. She is a blessing. I pray for God’s boldness in your life as you walk daily with our Lord Jesus Christ. This little Book packs a powerful punch. Misty’s thoughtful acronyms are indeed Heaven-sent, they make you smile, they make you think, they bless your heart and soul. A wonderful, powerful tool for witnessing, an encouraging pick-me-up when you need a quick but inspiring devotional. Be sure to add this one to your collection, you will not regret it. 3/27/2008 This book is AWESOME! First off I would like to mention that I have never been the biggest “reader”. In fact, I was the type of guy that got through the vast majority of my high school and college education from reading cliff notes! That was the first thing that struck me about Misty’s acronym book. It’s very “READER FRIENDLY”! Easy to read, easy to comprehend, and even more, easy to enjoy!! When I read this book I receive true inspiration. Inspiration that is divine and of a spiritual essence. This book has encouraged me and motivated me in several areas of my life and I recommend it to anyone who is searching for another quality faith-based resource. I love the fact that Jesus Christ is so apparent in all of this. To me, when reading something put out by a Christian author, Christ-centralism is KEY. The acronyms presented in this book not only come from the heart of Misty McGlugritch, but they tie into much of the true written Word of God. I know this book has touched my life, and I am confident that it is touching the lives of many others (not to mention all of the people over seas who got a free copy!). What an awesome book! AND WHAT AN AMAZING MINISTRY!! N.A.I.L.S. is truly a God inspired book and an original idea. Acronyms are a great way to remember things and a wonderful tool for teaching. The acronyms in this book bring a whole new definition to words, inspiring beyond traditional “dictionary” descriptions. The section on numbers, colors, symbols and their meanings brings more insight when reading the Word. I was so moved and impressed with Misty, her book and ministry that God lead me to purchase some books and give them back to her to give to our troops in Iraq. I share that not to receive credit, but to show how much N.A.I.L.S. motivated me. Remember, a word from God can change your life. Awesome sounds so cliché...but that’s what it is. I have read this book several times and I get something new out of it every time! I keep several copies on hand to give as gifts and have used her acronym’s in our Sunday school class. I love the healing scriptures listed in the back that Misty gave us. I was moved to make healing scripture cards for several friends who are going through cancer treatments as a result of reading Misty’s book this last time. Misty has such a big heart for God and such a sweet spirit! If you see a book signing in your area...run...don’t walk...so you can meet her in person and hear more about her testimony for the LORD!!! What a blessing it is to know Misty and see what the LORD is doing through her. Misty’s healing from cancer is a miracle in itself, then God blesses her with the awesome gift of creating acronyms! She uses her gift to uplift, encourage, and show to God’s power. This whole book is so inspirational and would make an ideal gift for anyone, for any occasion. This is such an inspirational book. It is great for daily devotions or when you just have a few minutes to spend with the Lord it is very uplifting and I would recommend it to anyone. If you want to grow close to God just consider reading this book it will change your life. It is different from any book I have ever read and I think it should be a household item. My wife and I see our meeting as a small miracle. Talking to you with your cancer healed as mine was healed cause a large lump and praise to God in my heart. I hope you find the small teachings I give to our little church uplifting. The tree is to show that we all have a job to do reaching the unsaved. The tree was just a tree until it was used to hold our Lord until all sins were forgiven. Billy Bob is an example of so many in this world today. The teaching for this Sunday seems to speak to me as an example of how people can be pulled together. Please feel free to use these teachings if you desire. God gave them to me and now they are yours. I repeated your testimony in church Sunday. Your healing gave all a lift. I finished your book Sunday afternoon and Liz is almost done. I especially love H.E.A.L.I.N.G It is Gods Now. I did not notice you had given me Proverbs 16:3 until we were home. I pulled out the Bible and read the verse. It seemed new and fresh. I check out a number of translations. This is the Amplified "Roll your works upon the Lord [commit and trust them wholly to Him; He will cause your thoughts to become agreeable to His will, and] so shall your plans be established and succeed." You will succeed and many will be touched by your work. I give you a verse, Psalm 103:3 "Who forgiveth all thine iniquities; who healeth all thy diseases:"
We will let the store manager know how much we enjoyed talking to you. God Bless And Keep You Under His Wings. I just got so blessed I am so very honored by the Blog Talk Radio and the friends on myspace and hisholyspace that are catching the vision of N.A.I.L.S. Necessary Atonement In Lamb's Sacrifice. I would love it if you would listen to the show and hear his message. He sent me a comment and said he just received my book and has decided to talk about it EVERYDAY on his live talk show. Please tune into Blogtalkradio and find Cross Divine Ministries with Pastor Jim Reese. Look for the date September 25, 2007. You can find his comment and photo on my homepage of www.myspace.com/mistymcglugritch.com it is under the list of friends photos. In the comment section. You will see the blogtalkradio icon. Click on that to go to the list of shows. I tell you the enemy was out to keep people from viewing my site yesterday and again today. My homepage was so messed up you could hardly read it at all. I could not send email or accept comments. I now know why now, This pastor was sharing my testimony with the world. He read Carman's Foreword and Pastor Johnny and Helen Ore's Introduction. He then began introducing the book to his audience. What an honor! His message was on Joshua~As for me and my house I will serve the Lord. It was very good meat and potatoes as he put it. The singers were a mother and son duo who are also on my top friends list. Her name is Anna Maria Marino and she is the co Host. The message was great I think you will like it. Let me know what you think. Some of you may be wondering why you are getting this. You are loved by me, share my vison, have been to my book signings or just lucky. I want the world to know how God is moving in Moore. I do not know if you know this but my daughter Jackie set me up a myspace page for my book N.A.I.L.S. Necessary Atonement In Lamb's Sacrifice. Well I have some N.A.I.L.S. testimonies from myspace and HisHolySpace that I want to share with you. This is B.I.G. Because It's God's! If you want to see miracles keep reading. There is an artist I have been writing to from myspace. She posted a bulletin to all of her friends, over 16,000. on my behalf about my book and my testimony healing of cancer. I was then contacted by a Christian Rap artist named Crucial (Matthew) Crucial is the founder of a group called Beat Lab 7. He invited me to join him on HisHolySpace.com it is just like myspace but for Christians only. You should join me there. There are a lot of business people and ministries on there as well as everyday people. Anyway once I was on there I saw a blog talk radio show that Crucial and Beat Lab 7 were going to be on. They were asking for callers to call the show and talk about their music. I can't stand rap music but I fell in love with their lyrics. So I called the show. It turns out the founder of the HisHolySpace.com is the radio host and he remembered me from his friend list and Crucial remember me and they began to talk to me about my book live on the air. I told them their music was a form of W.O.R.S.H.I.P. Warfare Of Redeemed Saints Honoring In Praise. They were so surprised to hear the acronym so I told them that they all come from God. He gets all the Glory, honor and praise I just hold the pen. Then I told them A.C.R.O.N.Y.M. A Creative Reminder Of Noticing Your Maker. They were tripping, as they say. So I was promised a future interview and hung up. Suddenly my HisHolySpace and Myspace pages started getting hits and friend request as well as my personal website. That night I received two acronyms that have blessed this group and created more exposure for the book. They are B.E.A.T. L.A.B, By Example And Truth Lyrics Are Born and C.R.U.C.I.A.L. Christian Rap Undeniable Creative In All Lyrics. go to either of these sites and click on their profile. They are in my top 40. Now a wonderful woman who goes by the name Kairos/Maranatha on her space and her son El Elyon 7 have blessed me powerful words of encouragement, strong prayer and their friendship. Funny thing is while I was chatting with each of them on myspace I had no idea they were mother and son. I also had no idea they too were a mother and son Christian Music artist. Here is the blessing, Karios had an interview to talk about her ministry ..."BRIDE OF CHRIST STANDING IN THE GAP MINISTRIES" toward the end of the show the host asked to speak to El Elyon who honored me by telling the host she should interview me and let the audience hear about my unique gift that God has given me and my healing testimony. This was THEIR Live radio show. These two love God so much they just radiate his Glory and encourage me every time I talk to them. They are wonderful people please check them out in my top 40 as well. As it turns out they hosted Carman at their church............Small world isn't it? It amazes me how we are all connected in some way the more my testimony grows and my territory expands. I HAVE BEEN ENJOYING THE WORK YOU SO SKILLFULLY COMPILED UNDER THE FATHERS GUIDANCE. THANK YOU FOR YOUR PATIENCE THROUGHOUT THE WEEKS. WE'LL BE MAKING IT A REGULAR ON THE PROGRAM EACH DAY. JUST ANOTHER BROTHER IN CHRIST TAKING THE HANDLES OF THE PLOW WITH HIS SISTER IN CHRIST, MY CO-HOST ANNA MARIA MARINO IS IN AGREEANCE (sic) WITH ME. BE SURE TO SUBSCRIBE TO THE PROGRAM SO YOU CAN ALWAYS GET BACK INTO THE ARCHIVED MESSAGES TO LISTEN IT. KEEP UP THE GOOD WORK AND PRESS ON MY FRIEND, I SEE WE..RE ON YOUR TOP 40, THANK YOU FOR THAT HONOR.YOU ARE ON OURS AS WELL. My publisher Ryan Tate of the most wonderful publishing company in the world, gave a speech at the International Christian Retail Show, 2007 in Atlanta and asked us to share our dreams with him. If he can help us achieve them he would. I wrote to him last week and I told him of my visions of seeing my acronyms on T-shirts, matted framed art, greeting cards, calendars, coffee mugs, bumper stickers, bookmarks and so much more. I also told him about my hearts desire to have Carman do his voice on my audio version of N.A.I.L.S. Necessary Atonement In Lamb's Sacrifice. He wrote me back and said they are going to have an executive meeting tomorrow morning and bring all this to the table. I know that means much prayer and brainstorming on all their authors behalf. Please keep praying for God to keep those doors open and to open many more. I have recently had another desire. That desire is to supply books to our prison ministries. God is developing an acronym for this but I can not speak it yet. For this to happen I need my website donations to come in full force. I need books sold to increase the royalties to fund these projects. I still have the "Buy a Book For a Soldier Project" and the Audio Version of N.A.I.L.S. for the Blind and Truck Driver ministry. As many of you know I can now testify that the Malaysia Project has been fulfilled. BJ and I were able to send 100 books to a Malaysian Missionary Man to teach his high-school students about God. I received email this evening that they arrived safe, in one piece and not rummaged through or separated by customs. It took a lot of people to pull that one off but the blessing was fulfilled and now the Spiritual Acronyms have gone beyond Oklahoma, beyond the United States and beyond the borders of the sea. This was my original prayer (the prayer of Jabez) when the book was first released. It has not been a year since the release and God has not stopped surprising me with each new encounter. Please be apart of this............It was Carman who called this unique gift of acronyms a ministry. If this is my ministry I pray for your support in every realm. You are all special to me or you would not be receiving this email. I wish I had the time to send this to each of you. There just is not enough time in the day to do that. Please keep BJ and I in your prayers as we go forth with all God has for us to do. I feel the best is yet to come. Can't you feel it? If not move in a little closer, I'll rub off on you. God is G.O.O.D. Giver Of Desires! P.S. Plans are developing to begin book 2. Unless God changes the title this will be called B.E.A.S.T. Bible Exposes All Satan's Tricks. and as they say in the movies......"Baby, you ain't seen nothing yet"! As Pastor Johnny always says "This will knock your socks off"
I am sending this group email to share this news with all of you at once. I'm sorry but time just would not allow me to write all of you individually. As you know yesterday was the anniversary of the 9 - 11 attack. This date has been earmarked as a day of chaos and confusion for people everywhere. Well, how appropriate and HOW God that this date would be the date of good news and blessings. You see, Carman's new CD "Instrument of Praise" was released yesterday. This CD will bring comfort and peace to a lot of hurting people. It will continue to bless those of us who love Carman and his World Outreach Ministry www.carman.org (check out his Passion for the People Project); AND ta-da, with out further ado.......HOW God, that this is the date that God would choose to answer the prayer request of one Malaysian Missionary Man named Edmund Hunt who had a vision. V.I.S.I.O.N. - Victory In Seeking Inspired Opportunity Now! You see, Edmund did a Google search on January 1, 2007 and found my website www.HisWordsNotMine.com . He wanted to use acronyms to teach his high school students about God. Edmund wrote and asked me if I would send him a few acronyms that I felt were appropriate from my book N.A.I.L.S. Necessary Atonement In Lamb's Sacrifice. Why did I mention Carman and his CD, well you see Carman wrote the foreword for my book. I was healed of malignant melanoma skin cancer at his concert 18 years ago. I know all of you know that, I just like saying it. It gives God the Glory and isn't that what all of this is about? Yes, and Amen! Anyway, I told a co worker (Pamela Henne) about the email and she suggested a fund-raiser to send all of his students their own book. So I wrote back to Edmund and told him that all of the acronyms in my book were appropriate and that I would send him a copy of the book right away. I told him about Pamela and her suggestion and he was overwhelmed with excitement and anticipation. Over the past 9 months and 11 days to the day, the students of Malaysia have been praying for the 100 copies of N.A.I.L.S. Necessary Atonement In Lamb's Sacrifice to be purchased and sent to them. Now through the support of pastors John and Helen Ore of Messiah Ministries the blessings of all of your prayers, donations and well wishes, God has supplied our need. BJ and I had a meeting with our pastors Ken and Angie Senchal of Heartland Community Church last night on 9 - 11 and they have blessed us with the last leg of the journey...the shipping cost. We can now send the books today! Please read Edmunds message to all of you, who have made this possible. Thank you for supporting this mans request. Please join me once again in prayer as to the safe arrival of these books and that these students and the eyes of all of those who see and hear the spiritual acronyms will be forever changed. C.H.A.N.G.E.- Christ Has A New Gift Emerging! God's timing is perfect timing! P.S. My prayer of Jabez is continually being answered as God HAS truly enlarged my territory. PTL for His awesome kairos timing. Please say thank you to your pastor. This is indeed an unexpected miracle Misty. When you declare the 'Customs Form," please tick the area for "Gifts". If there's space available, please write "These books are given as donation and are not sold to members of the public." The reason is that these books are new. I was told by the Malaysia Post Office officer. Please leave my name as the Post Office can contact me. Thank you so much for you, your husband BJ, your ministry, your church members, friends who donated to this ministry, and others who have been praying for this ministry partnership both directly and indirectly, please send them my greetings and appreciation. God is indeed in control of this situation. I am passing the baton of this book ministry to Ms. Yeoh Eng Bee, as she's the church worker and is a citizen of the town of Teluk Intan. It was great to meet you in Tulsa recently. I am Pat's friend. Thank you for autographing the book I bought for my Mother. After Pat told me about your book, I ordered Mom a copy. I had not sent it to her because Pat let me know you were going to be in Tulsa for a book signing. Monday after you autographed it, I shipped it on to her. She received it on Wednesday and called to tell me how delighted she was. On Thursday afternoon my brother called to tell me Mom was very sick and could not move her head without having excruciating pain! She could not even get to the car to go to the doctor. They called an ambulance and took her to the Emergency Room. The Cat Scan and blood work look fine. The ER doctor determined she had a horrific case of Vertigo ~ the kind that knocks you down for days. She was also dehydrated. They re-hydrated her and gave her some medicine for the pain and for the Vertigo. They sent her home to rest. Yesterday I was able to talk to her. She said she was still having to lay in bed and rest but was able to read some now (without having terrific pain from moving her head). She was reading your book and wanted me to know that it arrived at the perfect time for her. Thanks again for your ministry! If I may, the most powerful thing you can do is pray and ask God to heal. The second most powerful thing to do is to thank him before it is even done. You know where it says to speak those things as though they are even though they are not? The third thing is to speak positive. Remember the basket ball game. Your mom is the ball! So if I may, "The Vertigo is gone in Jesus name"! Thank you Father. Tonight when I spoke with Mom she said she was reading the Scriptures in the back at least 3 times a day. The Vertigo is almost gone. Now for the arthritis to be healed. I will ask her which is her favorite word and let you know. Wow! God is indeed blessing your ministry! How exciting!!! "N.A.I.L.S., has so touched my heart. Misty's book, N.A.I.L.S. is so heart touching, and so what I needed. I highly recommend this book to everyone. I use her acronyms daily. I am looking forward to her next book." "Misty I love your book. Every time I get a sermon and study it over and over I just keep adding to it. Its a good thing I don't have a month to prepare for these bible studies or I would never make it out in time. But with just a week I only get to add to it about 15 times. I just love the Lord and all of His children. I feel blessed to get to know you. Your book is very inspiring and definitely God will use it over and over again." Thank you for using N.A.I.L.S. to teach your lesson today. That truly blessed me and I want to tell you why. Before the book was released to the public my former pastor Johnny Ore (Who wrote the Introduction) prophesied over me that my book would be used to teach sermons, woman's groups, and bible studies. I had heard about pastors and Sunday School lessons being taught with this but I had not actually seen it until you used it. What a powerful tool God has given us.~ His Word." N.A.I.L.S is one of the most interesting books I've ever read. It touches the heart. I felt a real warmth when I read it. You'll want to go back and read it again and again. The book is such an awesome gift from God! People will definitely be blessed if they read the book! I try to find an acronym to go with each Sunday School lesson! Once people learn what an acronym is, they are like, oh, yeah! Cool! I didn't know what that was called! And God gives her these acronyms? They are amazed! I used to make up silly acronyms for acronyms I would hear in conversations or on the news when I was a little girl. But they were silly and definitely didn't bring glory to God! What an awesome gift! Hello Misty, my favorite writer. I have finished the book you wrote that is full of the best info one can read and a lot of people could learn from your book. I had 10% off so not too expensive. No problem with the cost and hope you write another book, but with all writing and no scriptures. Just my thoughts. "Books - a - Million" store has placed orders for more of your books. And how do you feel with your book on the market and many people reading your book of Important information? Bet you feel good about your accomplishment. And how does the future look for another writing by you? Will this be a large book? Will this include me your favorite fan? Ha. Kidding you. I am just bragging a bit about you and your publication. The freedom of speech has done its job with your great book of solid facts and I too had this right to write my honest opinion and am happy I had this right and opportunity to read your book. Time for me to stop this and thank God that we can write the way we want and do thank you again for your good book of most worthy information with God in mind. Please keep us updated with more writings if you like and I won't forget you and the book will be on display in our home. Wish you the best in future writings and more so, I wish you the best with your dear family. Love you in Gods way. Thanks for your prayers during your book signing. My uncle seems to be doing as well as can possibly be expected. He is extremely positive, and as you and I know, positive affirmations are the way to a cure, if it be God's will. I have found "homes" for all 10 of your books that I bought (of course, I'll keep my own personal autographed copy forever). Each book has been prayed over, and gifted as God directed. I do think the Lord has directed each one where He wants it to go. It's fun being an Armor-Bearer for you and God. The book N.A.I.L.S. is an excellent source of evangelism to anyone that wants to take a snapshot of God with a simplistic learning tool such as acronyms. I believe it has an amazing effectiveness with adults, teens and children, but especially the Military. Most military members are limited in their leisure time while on tour of duty. This creates a need for quick shots of God in an unusual way - God used Misty McGlugritch to create the book, N.A.I.L.S., which its convenience has proved itself useful for Soldiers such as Jeremi Hufford. He picked up the book and got a quick word of encouragement and will come back again and again with a different message every time. I encourage anyone that wants to do something for family, friends or the Military to visit the website and send N.A.I.L.S. to someone. We were the very close friends to Jeremi Hufford and you see by his words how God worked. They’re waiting on us to do our part, won’t you? I am currently on my second tour in Iraq, and as you all know, its not the easiest place to be for a year. I was sent the book N.A.I.L.S. in a care package from some very close friends of mine. When I got the book, it was in the middle of a particularly bad day here, and I was really busy. I laid the book down so I could finish what I had been doing and one of my friends came up and started reading it. After flipping through it, he marked a page and walked away. After I had finished up, I picked up the book and opened it up to the page my friend had marked. The page it was on had the word LIFE on it. It was broken down into Lessons In Faith Every Day. It was definitely God reminding me that no matter how bad it gets I should take time to talk to Him about it. It’s so easy to lose sight of your faith here, but through Misty’s amazing gift, God continually gives me little lessons in staying close to Him. I hope that her gift reaches out to you as powerfully as it has reached out to me. God Bless. I wanted to share with you another yet amazing thing that God has orchestrated. A couple of years ago I received the "Prayer of Jabez" from a coworker. I have been praying that prayer faithfully for the past several months daily. If you have not read the "Prayer of Jabez" book you may not understand what the prayer means or how it works so I encourage you to read it. Anyway, I have been asking God to take N.A.I.L.S. and expand its territory. I asked God to take it outside of Oklahoma, beyond the United States and beyond the borders of the sea. Since then I have sent many books to our soldiers with the help of others purchasing books. Wonderful comments from our soldiers are coming in. But I wanted to share this...... I received this email from a man in Malaysia. That is right Malaysia! Please pray for God to move on behalf of each person who comes in contact with this book and for the book to continue to go beyond the sea! This is what it is all about, isn't it? Doing Gods work! I am humbled to be an instrument of God. Edmund is helping two former mission schools somewhere in Malaysia. Due to the sensitive nature of his ministry, he is sharing and helping the students to understand and deepen their faith. These students come from both Christian and non-Christian backgrounds. The number of students that he is ministering to at both these schools grows daily. Please help him in supporting this school & Christian Fellowship ministry by buying a book. We need a total of $1000 for 100 books and approximately $451.00 for shipping depending on which International carrier we use. N.A.I.L.S. is truly an inspiring book. There’s an acronym for everyday. It makes you stop and think. Misty is a great person working for God, she’s very sincere and it shines through in this book. I can read for quite awhile or even just a few minutes and be touched by this book. Her life is truly a miracle and I’m glad she’s sharing her story of God’s miracles with the world. Keep touching lives I’m thankful that she has touched mine. given to us by God. And her book (N.A.I.L.S.) is a unique tool that many people will benefit from. It is also great to give as a gift. 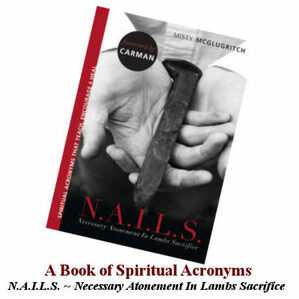 Nails is a must have for Christians to add or supplement their devotion time. It is evident that the acronyms, scriptures, and pictures were Spirit lead and inspired. This book is so easy and fun to read, but there is also enough with each acronym to prayerfully ponder and study. Each scripture from God's Word is wonderfully selected to support the message and insight of each acronym. Thank you Misty, for following God's lead in allowing Him to use you to write this book. Your testimony on the Healing Power of God and His Saving Grace is a fantastic ministry throughout this inspirational book. Knowing you personally only adds to the books authenticity. You are truly a light of God's blessings and your book is a blessing to all who read it. N.A.I.L.S. is a positive, spiritually uplifting book, written in a style that allows busy people to read in short periods, and still maintain continuity. Inspirational to read a page or two at a time, before starting your day. If you work in an environment where acronyms are used almost as a second language (and in this day and age, who doesn't), you'll relate to this book in a unique way that blends your technical senses with your spiritual mind. Easy read. Wonderful book and very different. This book is outstanding!! Very inspirational and a great learning experience. you can read it all at once or an acronym a day to lift your spirits and bring you closer to God. Misty's story on her amazing healing of her skin cancer is an awesome and truly amazing testimony. I recommend this book to anyone and everyone that needs a lift in their spirit! I want to tell you about our big, big God! BJ, my husband, couldn't work out at the gym with me one night because he had gone to a football game with his dad. So I went to the gym without him and as I was checking in at the front desk, the two young women who work there started talking to me. Well, I never made it in for the work-out! They were so nice and asked me lots of nice get-to-know you type questions. Right before I politely bid them a parting word to go work out I handed them one of my business cards for my book and I said to them, "If you get a chance to look at my website please do, I am a new author." Well, that started an entirely new conversation about how the book came into being. So I began with my diagnosis of malignant melanoma then my healing. The two women looked at each other when one of them began to cry and said, "We need to talk." She said that she had just been diagnosed with cervical cancer and they wanted to do a complete hysterectomy on her. She told me she was only 26 years old and she wanted children and this was not an option for her. I asked her if she believed in God, to which she replied yes. Next, I asked her if she had accepted Jesus as her Savior. Again she replied yes, so I began to witness to her about how big our God is and that the Bible was not just a book of stories. That real people with real problems had God come to their rescue every day. I told her that God made her and he can fix her. I quoted Jeremiah: 32:27 "Behold, I am the God of all Flesh. Is anything too hard for me?" She was still crying, but I asked if I could pray for her. She agreed and then I wrote down some acronyms for H.O.P.E., L.I.F.E. and C.H.A.N.G.E. I asked her if I could mail my book to her. She is in the reserves and I didn't want to wait till I saw her again. She agreed and I mailed it to her. Well, she received it and about 3 weeks later, she grabbed me and said they ran some tests and they all came back negative. Her cervical cancer is COMPLETELY GONE! We both started crying and I said, "See, we have a big, big God! I asked about the hysterectomy and they told her it was no longer necessary! I asked her about children and she replied yes, through tears that she could have them. We just hugged and cried some more.